Car batteries lose their power and performance with time hence the need to have them checked from time to time. You don’t want your car battery dying unexpectedly. If you own a car and want to know the status of your battery, it is important you get the car battery testers. This is a very important device that will tell the current state of your car battery. This article helps with the selection of the best car battery tester in the market. Go right ahead and select one that best works for you from the list. The Schumacher BT 100 starts our list as a top-notch battery tester with a 100amp load test. The 100amp load tests the 12V batteries while 50amp tests the 6V batteries. Schumacher is a great pick for testing the battery condition, load, the starter motor draw and a complete diagnosis of the charging system. It is a pretty simple design with an on/off button for easy use. With an expanded measurement range, the FOXWEKK battery tester is a good choice for testing the 12V and 24V. It is a good tester for checking the healthy battery status, aging status, and the actual cold cranking capabilities. The FOXWELL can determine bad cells on cars, boats and most 12-24V batteries. This is a good option to provide you with accurate results for your car battery status. 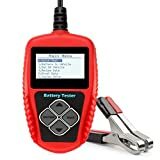 The SUNERPOWER car battery tester is a highly rated device that will analyze your battery load system, battery life percentage, resistance, voltage and also indicate the battery condition. It is a durable tester that continuously tests your battery power without affecting it. Reliable and accurate operations are attained through the wide CCA range of 5-9555. It is also versatile and compatible with AGM, flooded, Gel and deep cycle batteries. 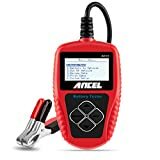 The ANCEL is a small and compact design that works pretty fast giving you an accurate measurement of your car battery. It is easy to use, and beginners can use it without any help. ANCEL tells you everything you need to know about your car battery from voltage power, battery life, and ohm resistance. The tester offers a wider test range of 100-2000 CCA. This is a well-built unit with a large LED screen to display the results. The Topdon is a standard car battery tester that is compatible with the world’s most leading batteries. It offers a wide testing coverage of charging, cold cranking, gel and common battery faults. Efficient results are offered with the unit telling you when to replace the battery. A polarity reverse connections enable the tester to work efficiently without damaging the battery. Coming in multiple languages, this is your ideal car battery test. The isYoung car battery tester is a perfect pick for testing all your 12V and 24V batteries for accurate results. It testers the starter, charging system, cranking and several other parameters to enable you to know when to get a replacement. Common faults when starting your vehicle can also be detected enabling you to find the problem with your car fast. It is a versatile choice that works with most common batteries. A reverse polarity connection further improves protection of your battery when testing. 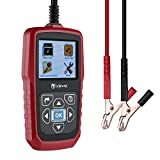 Quicklynks will accurately and quickly measure that cold cranking amps and the capability of the vehicle to start in seconds. It gives you a health report of your car battery and detects common problems that affect the vehicle starting system. The tester supports both the in and out of vehicle tests. It has multi-testing features that give you a wide range of results. The tester protects itself through a polarity reverse connection. Udiag is a multi-test battery tester and good option to keep your car battery in check. 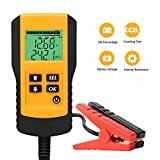 It quickly and accurately measures the actual cold cranking, battery charging system, starting amps and common vehicle faults. It is a versatile choice to analyze the battery of your car in different ways. You can test all the 12V batteries with ease. The reverse polarity connection further improves safety by preventing your car from emitting light. The Topdon Artibattery 101 is the best car battery tester on the market right now with a plethora of features. It is a highly rated tester with efficient testing and directly detects a bad battery. You can test the battery with electricity or no electricity and still get efficient results. Standard testing is offered, and compatibility with a wide range of batteries makes it a top pick on our lost. I highly recommend this one for anyone looking for good value for his money. Make sure you get one of this car battery testers with you in your car to avoid a dead battery when you least expect. These are the best picks on the market right now and will offer you a good value for your money.